From July to September, we ran a successful Indiegogo campaign — some pre-purchases to help a small amount towards purchasing equipment, constructing washrooms & air systems, and starting our lease. We’re very thankful for that initial $3000, but since we’re not opened yet, we figured that a lot of our various perks and pre-purchases can certainly still be up for grabs! Thus, here on our website, as well as at our various fundraising shows being held at the Rudolf Rocker in the interim between the original Purple Room and Purple Room 2.0, we’ve got a selection of the original campaign perks still available for purchase. We think there are some pretty cool options here: limited edition t-shirts (design pictured to the right), stickers, and buttons; pre-paying for a night’s rental in our new home (and an early pick at dates! ); a special 3-night pack of rentals; and of course our big “tickets for a year” options! We want to make sure that the perks we offer along with supporting this campaign have a fair and tangible value for you. We hope that any amount you decide to contribute corresponds with a perk that you would’ve happily spent your money on outside of this campaign. We’re simply asking for up-front funds to help get things off the ground. Check them out below. We’ll tweet out a personal thanks to you. 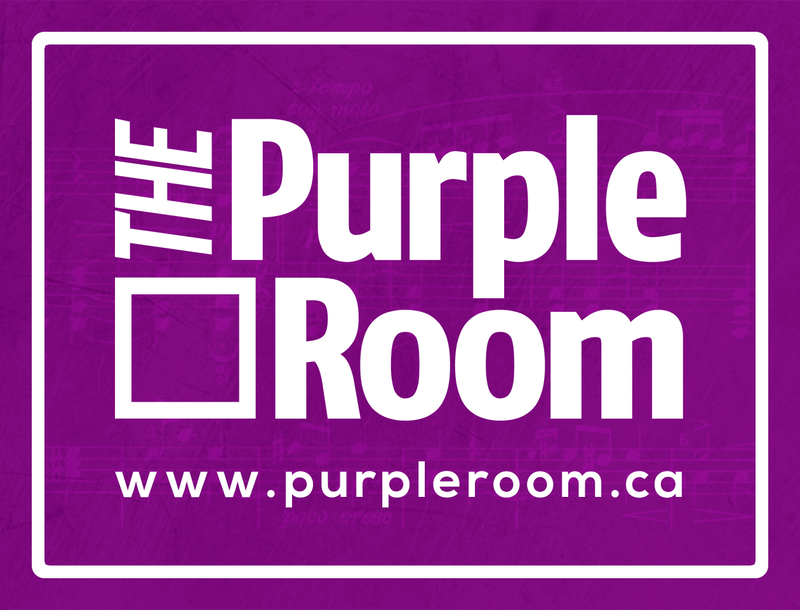 Limited edition Purple Room sticker (designed and created for this campaign). Limited edition Purple Room button (designed and created for this campaign). Both a sticker and button. One free beverage of choice from the new café, plus sticker and button. A Purple Room t-shirt, designed by local artist Laura Ali (tinybee.ca). Admission to one event of your choice in the new Purple Room, plus sticker and button. A single admission to a show of your choice in the new Purple Room, along with one drink and one food item of your choice from the café, plus sticker and button. A single admission to a show of your choice in the new Purple Room, one drink and one food item of your choice from the café, a t-shirt designed by local artist Laura Ali (tinybee.ca), plus sticker and button. Two admissions to an event of your choice in the new Purple Room, along with two drinks and two food items of your choice from the café, plus sticker and button. 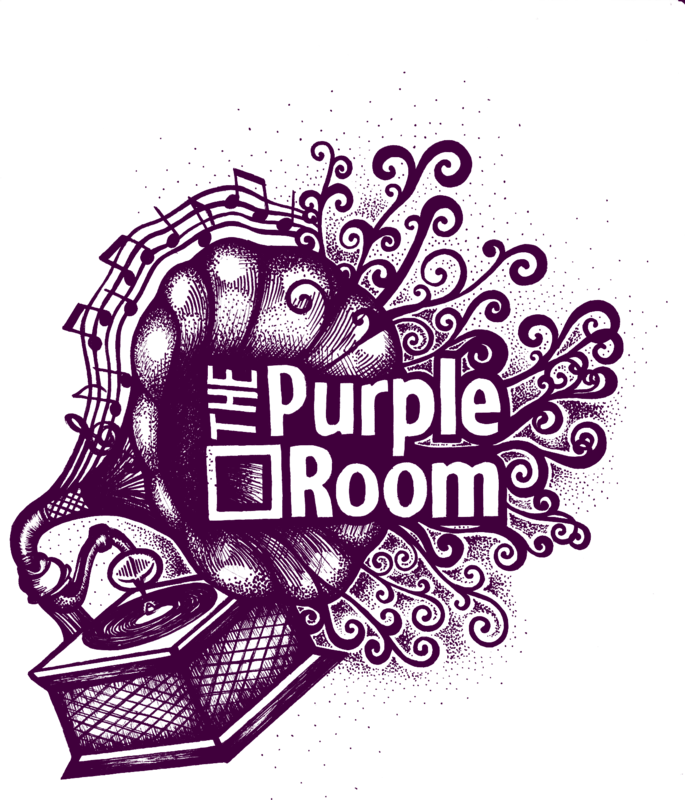 Two admissions to an event of your choice in the new Purple Room, two drinks and two food items of your choice from the café, a t-shirt designed by local artist Laura Ali (tinybee.ca), plus sticker and button. Have your name, a friend/family member’s name, or a phrase of choice permanently incorporated into the planned mural wall. (We reserve the right to deny certain phrases for obvious reasons.) Plus sticker and button. One evening live event booking to be scheduled when the opening date of the new Purple Room is announced. Personal admission (non-transferrable) to 10 events of your choice within the first year of operation of the new Purple Room, plus one free drink and food item of your choice from the café, plus sticker and button. The Purple Room team will write a song about you (or a topic of your choice) and, with a group of talented musicians, will perform it on the opening night of our new space. This performance will also be professionally recorded, with an edited video of the performance of your song provided to you on a medium of your choice (video file, DVD, Bluray). Three live event bookings to be scheduled when the opening date of the new Purple Room is announced (could be part of a series or stand-alone events). 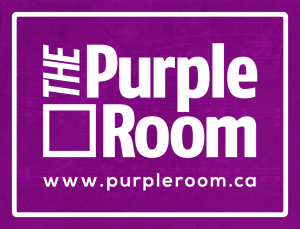 Personal admission (non-transferrable) to any public show or event in the new Purple Room during its entire first year of operation, plus an event booking (private or public) scheduled once the opening date of the new Purple Room is announced. 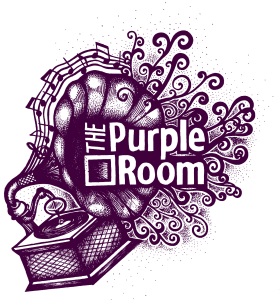 Personal admission (non-transferrable) as well as admission of a guest of your choice (this person can change) to any public show or event in the new Purple Room for its entire first year of operation, plus an event booking (private or public) scheduled once the opening day of the Purple Room is announced.